ReFind 1.1 (Mac App Store link) puts the folders and files you use most at your fingertips. 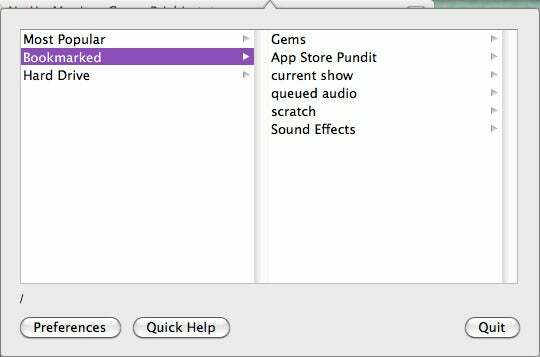 Developers, designers, audio pros, or anyone who uses a large number of folders will welcome the ability to jump directly to a frequently used folder or file from within any application. Even better—you can do so without searching, or clicking through stacks of open Finder windows. Once installed, ReFind watches which folders you use most often. It appears in the menu bar, and is accessible with a keystroke. Folders you work in a lot appear under Most Popular; you can also bookmark folders you use often. Or, open Hard Drive to browse your Mac’s startup disk, including the normally invisible directories used by Mac OS X. In the otherwise alphabetical folder list, those you use most often appear at the top. ReFind learns your behavior as you work, updating the list accordingly. Having access to hidden folders is useful if you’re a developer—or if you like to tinker with the system—but it’s a bit confusing, and potentially risky for non-technical users. It would be great if ReFind provided the ability to choose whether system folders appear in its browser. Developer-friendly ReFind features include the ability to copy the path to a selected folder with a keystroke, and the option to open a selected item in Terminal. Selecting a folder in ReFind takes you to its Finder window. 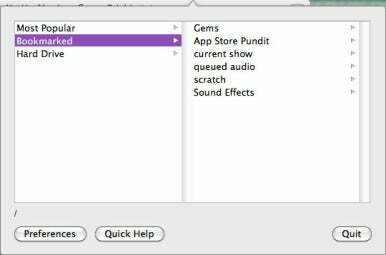 You can choose to launch files from ReFind, too. Though you can invoke ReFind while working within any application, its features are not available in Open dialogs, where a designer might want quick access to folders of photographs to import into a page layout program, for example. If your work involves manipulating a large number of files, ReFind will save you time by anticipating your need for favorite folders, and reducing the need to dig through Finder windows on your desktop.